Finnoo is set to become a neighbourhood of 17,000 residents stretching from the Länsiväylä motorway to the sea, with a centre of high-rises around the metro station. 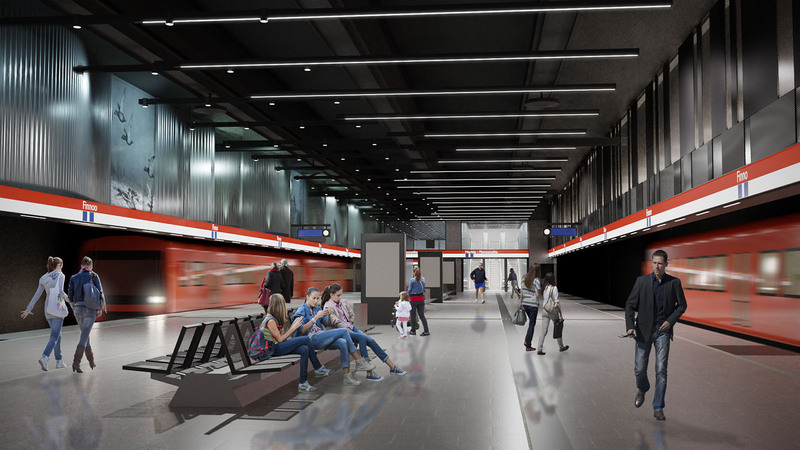 The Finnoonsilta entrance will be combined with future commercial services. In contrast, the Meritie side is a more standalone entrance. The metro station’s glass, metal and concrete surfaces are softened by tones inspired by nature on the nearby coast and wetlands. The glass facades have graphic patterns reminiscent of the flora found in bird-rich wetlands, while the interior colour palette is inspired by warm marine and coastal tones. The look of the platform area is highly asymmetrical. The northern side of the platform symbolises the sea, coast and wetland bird habitats, while the northern end reflects the urban environment. News on the work stages at the Finnoo site can be found under the Worksite areas section.